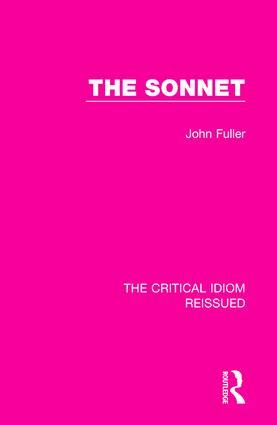 First published in 1972, this book examines the sonnet, one of the most complex yet accessible of verse forms. It traces its history, concentrating primarily on its technical development, and fully explains the differences between the Italian and English sonnet. The study looks at several different kinds of sonnet, including condensed and expanded sonnets, inverted and tailed sonnets and irregularities of metre and rhyme, and concludes with a survey of the sonnet sequence. This book will be useful to students of prosody and English poetry as well as those concerned with the practice of verse.